To learn about different theories of nutrition. 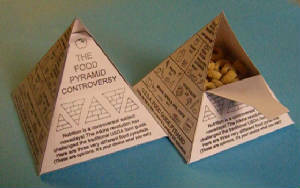 The food guides included on the sides of the pyramid are: the traditional USDA food guide, a modified version of the Atkins guide, and the Willet food guide (named after the inventor). Nutrition is actually a fairly controversial subject. The traditional USDA food pyramid (seen on just about all cereal boxes in America) has critics who say that it has contributed to the increase in obesity because of its heavy emphasis on carbohydrates. So here are some alternatives for you to learn about. In the end, of course, it’s up to you what you eat! Students cut and assemble the 3D pyramid, then fill it with their favorite healthy snacks. The teacher/adult is expected to help them read the information on the sides of the pyramid and engage them in meaningful discussion about the advantages and disadvantages to each theory. The teacher/adult may want to do some extra research ahead of time (key words in Google search should provide plenty of info). Copies of the pattern page printed onto heavy card stock, scissors, white glue, little snack bits of your choice, such as nuts, dried fruit, granola, cereal bits, etc.